Carpenter ants are so named for their skill at constructing their homes from wood. These large ants are excavators, not wood feeders. Still, an established colony can do structural damage to your home if left unchecked, so it's a good idea to learn to recognize carpenter ants when you see them. Carpenter ants belong to the genus Camponotus. Carpenter ants are among the largest ants that people encounter around their homes. Workers measure up to a 1/2 inch. The queen is slightly larger. In a single colony, you may find ants of varying sizes, however, as there are also smaller workers that reach just 1/4 inch in length. Color varies from species to species. The common black carpenter ant is, predictably, dark in color, while other types may be yellow or red. Carpenter ants have a single node between the thorax and abdomen. The top of the thorax appears arched when viewed from the side. A ring of hairs encircles the tip of the abdomen. In established colonies, two castes of sterile female workers develop – major and minor workers. The major workers, which are larger, defend the nest and forage for food. Minor workers tend to the young and maintain the nest. Most carpenter ants build their nests in dead or decaying trees or logs, though they do also inhabit landscape timbers and wooden structures, including people's homes. They prefer moist or partially decayed wood, so carpenter ants in the home may suggest a water leak has occurred. Carpenter ants do not eat wood. 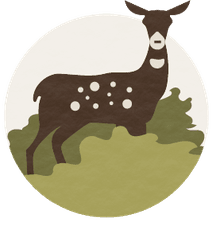 They are true omnivores and not all that picky about what they will consume. 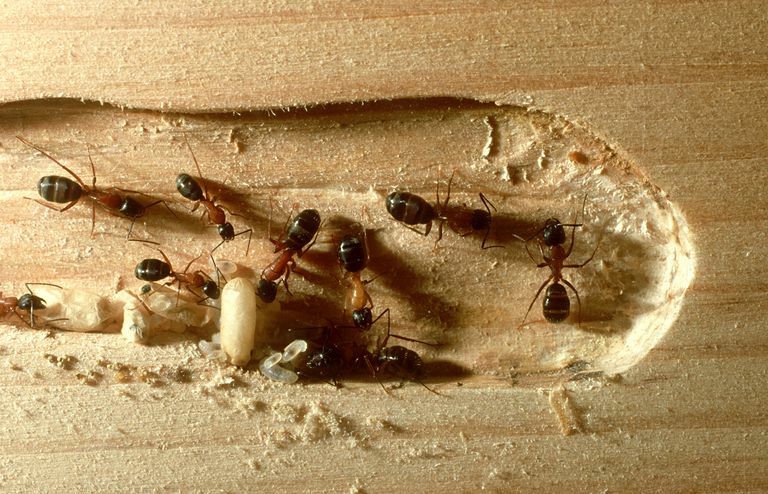 Carpenter ants will forage for honeydew, the sweet, sticky excrement left behind by aphids. They'll also eat fruits, plant juices, other small insects and invertebrates, grease or fat, and anything sweet, like jelly or syrup. Carpenter ants undergo complete metamorphosis, in four stages from egg to adult. Winged males and females emerge from the nest to mate beginning in the spring. These reproductives, or swarmers, do not return to the nest after mating. Males die, and females establish a new colony. The mated female lays her fertilized eggs in a small wood cavity or in another protected location. Each female lays about 20 eggs, which take 3-4 weeks to hatch. The first larval brood is fed by the queen. She secretes a fluid from her mouth to nourish her young. Carpenter ant larvae look like white grubs and lack legs. In three weeks, the larvae pupate. It takes an additional three weeks for the adults to emerge from their silken cocoons. This first generation of workers forages for food, excavates and enlarges the nest, and tends to the young. The new colony will not produce swarmers for several years. Carpenter ants are largely nocturnal, with workers leaving the nest at night to forage for food. The workers use several cues to guide them to and from the nest. Hydrocarbons from the ants' abdomens mark their travels with a scent to assist them in returning to the nest. Over time, these pheromone trails become major transportation pathways for the colony, and hundreds of ants will follow the same path to a food resource. Camponotus ants also use tactile trails to find their way back and forth. Ants feel and remember the distinct edges, grooves, and ridges in tree trunks or sidewalks as they move through their environment. They also employ visual cues along the way. At night, carpenter ants use moonlight to orient themselves. To appease their appetites for sweets, carpenter ants will herd aphids. Aphids feed on plant juices, then excrete a sugary solution called honeydew. Ants feed on energy-rich honeydew, and will sometimes carry aphids to new plants and "milk" them to get the sweet excretion. Camponotus species number about 1,000 worldwide. In the U.S., there are approximately 25 species of carpenter ants. Most carpenter ants live in forest ecosystems.